Don't Miss Breathe Owl Breathe in Concert Feb 20! This is a treat for the ears and eyes of the Eastern Upper Peninsula. This dynamic band always has an interesting and unique show. 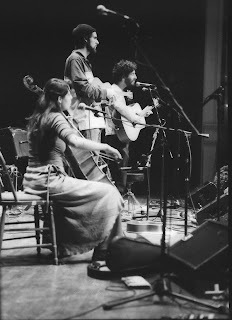 Breathe Owl Breathe has fresh new folk music with a little comedy, a little classical, and a little whimsy thrown in for good measure. They take their audience on a great ride through the wilderness and beyond with their guitars, strings, keyboards, and percussion. The group has been featured in numerous festivals all over Michigan: Blissfest, the Sleeping Bear Dunegrass and Blues Festival, and many more. Breathe Owl Breathe will perform at the First United Presbyterian Church at 555 Bingham Avenue, Sault Ste. Marie, Michigan on Friday, February 20 at 7:00 p.m. Proceeds of the concert will benefit the Soo Theatre Project. Tickets are $12 in advance, $15 at the door, and $8 for students. You can buy tickets at the Soo Theatre Project office Monday through Friday from 10 a.m. to 7:30 p.m. and on Saturday from 10:30 a.m. to 1:00 p.m. If you have any questions or inquiries, please call the Soo Theatre Project office at (906) 632-1930 or email us at sootheatre@gmail.com. You can find out more about the group at their website (breatheowlbreathe.com), and also at Fox on a Hill Productions and Earthwork Music. 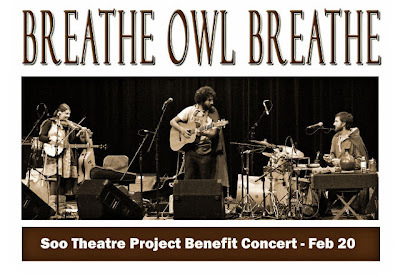 The Soo Theatre Project is pleased to present Breathe Owl Breathe in concert on Friday, February 20 at the First United Presbyterian Church, 555 Bingham Street, in Sault Ste. Marie, Michigan. Proceeds will benefit the Soo Theatre Project. Fresh new folk music with a little comedy, a little classical, and a little whimsy thrown in for good measure, Breathe Owl Breathe takes the audience on a great ride through the wilderness and beyond with their guitars, strings, keyboards, and percussion. Show time at the First United Presbyterian Church is 7:00 p.m. The doors will open at 6:30 p.m. Tickets are $12 in advance, $15 at the door, and $8 for students. Tickets are on sale at the Soo Theatre Box Office, 534 Ashmun St. in Sault Ste. Marie, Michigan. For more information, call the theatre at (906) 632-1930. You can find out more about the group at their website, and also at Fox on a Hill Productions and Earthwork Music.